The geographic and spiritual mobility of leaders of New Age and alternative religious groups as well as the hybridization of symbolic references are shaping the practices and discourses of such groups write Swiss researchers Manéli Farahmand and Sybille Rouiller in an article published in the newly-released issue of the online journal New Diversities (18:1), published by the Max Planck Institute for the Study of Religious and Ethnic Diversity. “Religion and Superdiversity” is the topic of this issue, published in October and freely accessible. The two researchers base their observations on ethnographic research on Mexican neo-Mayanism and French Celtic neo-shamanism, paying special attention to the meaning of tools used during rituals. These movements cultivate both specificities linked to an indigenous claim (Mayan or Celtic, in the two case studies) and a shared dynamic derived from New Age culture that serves as a platform for hybridization. Mobile spiritual leaders as well as their followers travel and meet each other. Despite the emphasis on specific ancestral roots, they borrow from other traditions, seeing them as sources of enrichment. They incorporate such experiences in their spiritual quests in order to give them added legitimacy. This practice leads to ongoing rearrangements. Objects used during rituals come from different countries and different spiritual traditions, illustrating positioning in both local and global contexts. Borrowing is not random, but it is related to the journeys of those involved as well as to common alternative spiritual references. 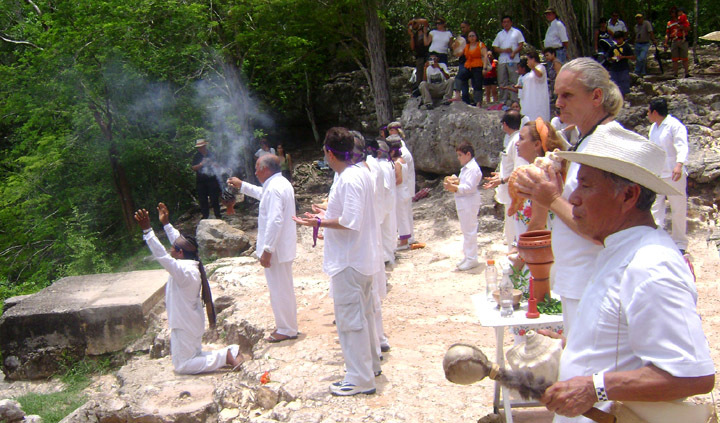 Photographs of the Mayan and Celtic groups taken at the Spiritual Planetary Summit in Mexico in 2012 and observed by the two scholars show them wearing very similar outfits. While each has its own spiritual path, they share global objectives and ideals as expressed by their participation at international New Age community events.